Louise Turner is a singer songwriter from Salford, whose pure, yet strong, vocals puts her on a par with the likes of Olivia Newton John and Eva Cassidy, whilst oozing a contemporary freshness in her pristine and melancholic music. With her spacious and unravelling catalogue of sounds, Turner makes you immediately feel at ease, allowing you to drift away to your own inner sanctuary and soak up the exquisite sounds. Along with her good looks and vintage charm, Turner is an accomplished songwriter and experienced singer. Having worked as a session singer with Elbow, DC Fontana and Edward Barton, Turner has also worked with Kati Jagel on a fusion of art noir and pop art videos, hailing her as one of Salford’s rising new stars. 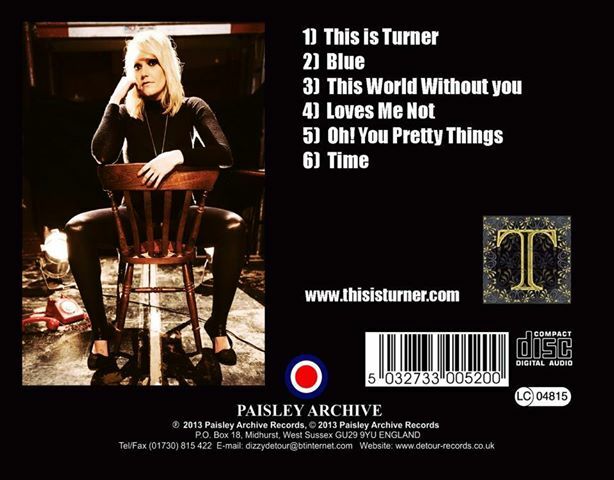 After receiving rave reviews of her live performances, Turner has now completed her debut EP. Produced by Yves Altana, (who has worked with I am Kloot, Mark Burgess and Peter Hook), “This is Turner” has been selected as my EP of the month. “This is Turner” is the perfect introduction to the EP, emerging like an Eastern sunset. With its tweeting bird effects, relaying vocals and mesh of sitars, “This is Turner” takes you into a trance-like state, inviting you into a psychedelic world likened to the Beatles’ circa 1967. With its acapella style introduction “Blue” lays bare the raw emotions of the song, which is reinforced through the dreamy surreal lyrics. It’s once the choppy piano merges, that Blue’s melancholy is awakened. Along with the dreamy dual vocals, art-rock bass and gentle acoustic riffs, the essence of “Blue” is captured through Turner’s stunning vocals. As well as providing the animating narrative of the song, Louise has a real talent for conveying emotion through the subtle ebbs and flow of discord in her voice. With its light-footed, jangly and quivering riffs, “This World Without You” is a sprightly number, whose exuberant and catchy chorus is reminiscent of the Burt Bacharach classically crafted compositions of the 60s. It’s a polished production, whose immaculate vocals soar against the bouncing beats and clapping percussions. It’s a great song, whose underlayer of new wave synths add a contemporary dimension to the song. Along with its curling riffs “This World Without You”, dances with effervescent streams of trumpets that take you back to the whirly skies of San Francisco. “Loves Me Not” is a hauntingly beautiful song whose stunning and classically composed vocals magnetise the deep-seated melancholy. Along with its heartfelt lyrics and baroque/classical backdrop of sounds, “Loves Me Not” cuts deep into a sorrowful vein. With its wistful piano, staccato violin strokes and sweeping cello, “Loves Me Not” is elegantly poised, whilst striking you with a windswept melodrama. Along with its springy bass and curving space-rock riffs, “Loves Me Not” projects an understated barren grandiose that heads towards Pink Floyd territory, without eclipsing the moonlight motif. “Oh! You Pretty Things”, is an excellent cover of David Bowie’s hit song from 1971. With its choppy and slamming piano , “Oh! You Pretty Things” is composed in the same vein as the original, but with the added bonus of Turner’s stunning vocals. Along with the Beatle-esque harmonies and shaky beats, “Oh! You Pretty Things” does a great job of capturing a retro song, whilst adding its own individual take. With its stripped down soundscape, “Time” unravels with a wistful beauty likened to Kate Bush and whose sweeping violins and melancholic piano fills the song with a sense of Baroque grandeur. It’s a pensive song, whose droning oboe and customised trumpet, provide the abstract backdrop for the cosmopolitan and sentimental narrative. Along with its quivering violins and slamming beats, “Time”s sentiments are intensified through the melodramatic crescendo, taking the song to its fading finale.